Certificate - Saricy & Co. The Gem and Jewelry Institute of Thailand (Public Organization) is the governmental organization in the form of a public organization in accordance with the Public Organization Act B.E. 2542 and was established in compliance with the Royal Decree on Establishment of the Gem and Jewelry Institute of Thailand (Public Organization) B.E. 2546. The establishment was published in the Royal Gazette on December 31st , 2003. The institute is under the supervision of Minister of Commerce. sealed in a clear plastic pocket. 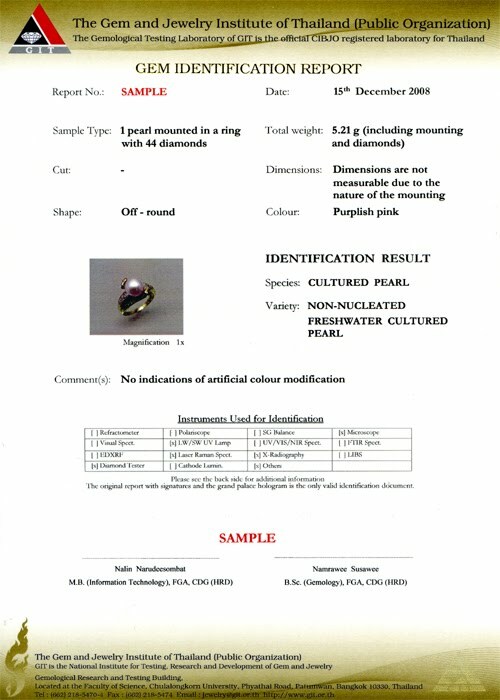 photograph of the Pearl. Quality grading for color, clarity and cut is available for ruby and sapphire.